In the wake of having hosted Pope Francis at Catholic University of America for the Canonization Mass of Junipero Serra, some of the university’s graduate students have given ZENIT a closer look at what was going on behind the scenes and what their reactions have been to Francis’ visit, before and after. Jordan Blank, a PhD student at CUA, told ZENIT that people on the campus have definitely been excited. T-shirts with the slogan “Power to the Papal” — a play on “Power to the People” — have been on sale and as for the Mass itself, tickets had to be raffled since everyone wanted one. The excitement helps compensate for the traffic, the student reflected. Blank speaks from her experience studying in Rome, where she often saw Pope Benedict XVI, affirming that though the Popes have different styles, she loves both. John Brungardt is a PhD student in philosophy at the Catholic University of America who did his undergrad studies at Thomas Aquinas College. Originally from Wichita, Kansas, John is the oldest in a family of 10. “Apart from concerns from across the political spectrum about the implications of Pope Francis’ writings or official actions as pope, his concern for souls is very clear,” Brungardt said. 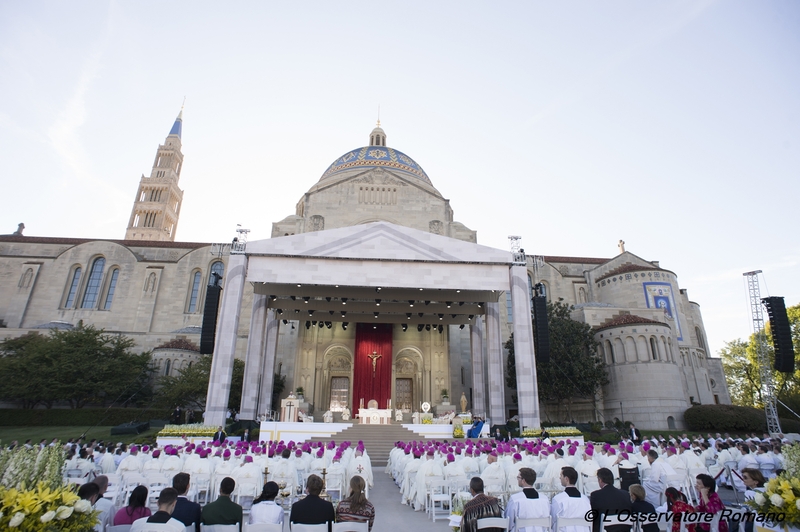 The impact on CUA, the graduate student continued, has been great—”the excitement before and during was palpable, and the landscape was transformed to accommodate the number of guests and the canonization itself.” He noted that all of CUA was very honored to host the Pope, and the faithful and other guests who came for the Mass were equally thrilled.